In the age of desktop printing, programs like Adobe InDesign and state-of-the-art laser printers have opened up a world of possibilities. Reflecting on the path leading to these inventions, it’s difficult to conceive of the time and effort that went into creating a single book before the year 1440. This was the year that Johannes Gutenberg adapted the technology of a screw-type wine press —fitting it with movable type — thereby inventing the world’s first printing press. Not surprisingly, production of books soon jumped from a few thousand to over nine million by the end of the 1400s. This print revolution is now exquisitely documented in an intimate exhibition titled Seeing Music in Medieval, currently on view in the manuscript gallery at Baltimore’s, Walter’s Art Museum. The Museum has an astounding number of illuminated manuscripts in its collection – more than 900 – and the curators bring them to light in small, themed exhibitions. Before Gutenberg and his famous Bible, producing books was extremely laborious. Pages of parchment or vellum were prepared from animal skins. The process involved curing, stretching, scraping, and cutting each sheet. The line spacing was then meticulously measured out and marked with small pricks made by an awl before the lines were ruled, and the scribe could begin to write out the text. Work was always performed in daylight, and never by candlelight because they couldn’t run the risk of fire. Each step of the process had its specialists. There were calligraphers and copyists (the equivalent of modern day typographers and layout artists); they had correctors (line editors and copy editors); and illuminators (our illustrators and graphic designers). Once the copying and the illuminating were finished, the pages were folded and nested together to form signatures. These were sewn and bound between book boards covered with cloth or leather. One book could take up to a year to produce, and each book was an individual work of art. Around twenty manuscripts and objects make up the exhibition at The Walters, which has been curated by Chiara Valle. The manuscripts range in size from a velvet-bound Book of Hours (approximately 3” by 4”) used for daily devotionals, to a large music book (about 18” by 24”) around which groups of monks would have gathered to chant the liturgy. Music underlines, accents and defines the content of every page. There is actual music written out in the form of neumes (from the Greek, pneuma, meaning breath), which were the precursor to modern musical notation, and there are the musical illustrations that decorate the pages of every book. These intricate drawings picture the music makers, the angels, people, and even animals that dance and play their instruments in the margins and illuminated letters. Every page is a jewel, with its beautifully formed script and gold plated illustrations. Visitors will marvel at the beauty but will also find the exhibition fascinatingly informative. 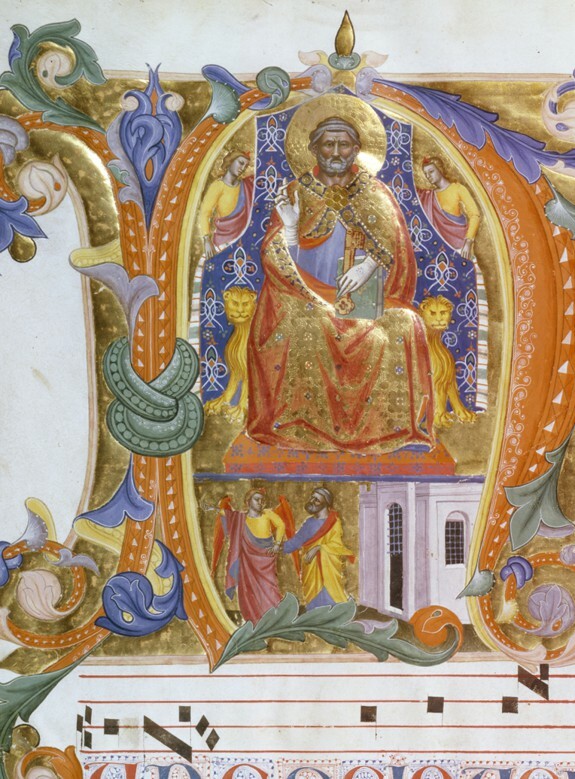 The creative teams responsible for the production of medieval books were dedicated to depicting their contemporaries. Their close attention to the rich details of daily life offer a penetrating glimpse into the time period, portraying human pursuits, their manner of dress, and – germane to this particular exhibition – their musical instruments; organs and harps, fiddles and lutes, pipes and tabors. An interesting dissertation unites the exhibition, providing insights into how medieval thought about man’s relationship to the order of the universe was reflected in music. Harmony and dissonance, they believed, were the equivalent of good (heaven) and evil (hell). 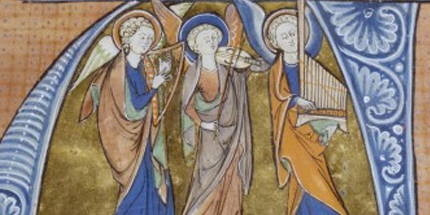 Seeing Music in Medieval Manuscripts is a feast for the eyes. The collection offers insights into the early stirrings of the Western musical cannon and explores the art of bookmaking, a process that has remained, despite technological advances, essentially the same for every beautiful book we hold in our hands, to this day. The exhibition will continue at The Walters Art Museum through October 12, 2014. Admission is free!